Win free Producer Sessions Live tickets! 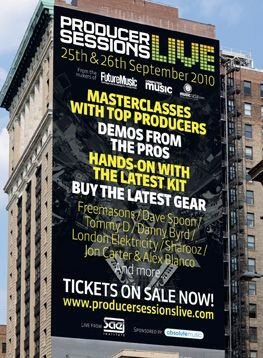 On September 25th and 26th the SAE Institute in London will play host to Producer Sessions Live, a one-of-a-kind music production event featuring seminars from some of the biggest and best producers in the biz (including Freemasons, Dave Spoon, London Elektricity, Jon Carter and Alex Blanco), plus tech demos from Korg, Cakewalk, Digidesign and more. For more details and to buy tickets, click here. Computer Music has tickets for Producer Sessions Live to give away to 20 lucky competition winners - 10 for Saturday 25th and 10 for Sunday 26th. The closing date is the August 22nd, so get your entry in now!